Get a Free Estimate on Gutters! Are you currently experiencing flooding in your basement? Are you noticing landscape erosion? Has your home recently started having foundations issues due to precipitation not being properly channeled away from your residence? If you answered yes to any one of these questions, then take a good look at your home. Is your home one of the many in western Wisconsin without rain gutters? If so, then that might be the cause of your problems. Fully functional, seamless gutters are designed to catch rainwater and snowmelt and effortlessly carry it away from your home. 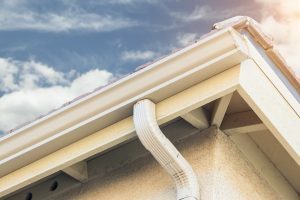 Without gutters to channel away precipitation, your home can start to experience the aforementioned problems. There are few things more bothersome than wasting your precious time cleaning out your gutter system. That is why, at Clear Choice Energy Solutions, we also offer Leaf Blaster Pro stainless steel gutter guards to pair with our seamless gutters. These gutter guard systems can fit on any size rain gutters – so we can affix them to any existing gutter system as well – and are built of a stainless steel micro-mesh construction that resists rusting and stands strong in all bouts of weather. With its Z-Bend technology, wind can more easily push debris off of the cover. Plus, it is designed to keep pine needles, leaves, sand, and other fine debris from never entering and clogging the gutter system while also maximizing water flow. And, possibly best of all, our gutter guards are backed by a 40-year warranty covering defective parts for your peace of mind. Don’t wait until expensive home repairs arise to address the lack of having a functional gutter system at your home. Contact Clear Choice Energy Solutions and to get info on seamless gutters and gutter protection installation today. We proudly serve all residents of La Crosse, WI, and surrounding communities.